Throughout my whole life I've had an affinity for buildings. I love to study them, photograph them, design them. Even as a child I would spend hours on end with my building blocks, sketch books, and eventually computer drafting programs. I can't remember ever wanting to be anything but an architect when I grew up. When I was in college I realized that I was more interested in working with existing buildings and decided to pursue a career in historic preservation. Years later, I am still discerning what ministry will fulfill my passion for buildings and my desire to serve others. The building I am in charge of renovating. Now in my apostolic (second) year of novitiate, I have returned to one of the organizations where I previously volunteered (Working In Neighborhoods) to continue exploring a ministry in housing and community development. My main project is the renovation of an empty century-old building that will hopefully provide affordable housing in one of the poorest neighborhoods in Cincinnati. While it is a rather daunting task for me, I am also extremely excited for the opportunity to work hands-on in a field that I have been journeying toward my entire life. Recently when I was reflecting upon and praying with all this, I came across a poem entitled "The Builders" by Henry Wadsworth Longfellow. In addition to its obvious architectural imagery, I think it has a beautiful message about how we live our lives. Since I believe the beauty of poetry is its openness to interpretation, I will let you read it for yourself and receive whatever message the Spirit offers you. Right now I have a headache, my brain hurts, my eyeballs have filed a complaint with OSHA, and I’ve been talking to myself for two hours. I like to communicate with myself out loud when proofreading a paper or trying to pull a lecture together. Sometimes I do it to refine arguments. Over and over and over I throw my ideas into a raging fire and some “product” comes out. For reasons I don’t understand, my golden calf often (almost always) moos better when I’m alone than it does when I give it to others. How it saddens me that I can only be brilliant when I’m by myself! It’s a strange cross. Tomorrow I will teach college students Augustine’s Tractate 122 – an exegesis of John’s big fish story. Lord, teach me how to throw my words into the fire and offer them up to you as a sacrifice which pleases. As a final word, I’d like to share with the Sisters of Charity of Cincinnati my joy at having gotten to know one of your sisters, Terry Deri, over the course of this last year. Terry passed away peacefully on Tuesday at Mount St. Joseph, the Cincinnati motherhouse. Although having known her for only a short time, I will really miss her. Terry was a sharp conversationalist, had a great sense of humor, and was a truly interesting woman. She lived for a number of years in Peru and many of her favorite stories were from this exciting time in her life. She worked as a counselor when she returned to the United States, and she had keen insights from this work into human motivations. Terry’s last sickness was painful and hard, but she was never without the aid of one of my own sisters, Cory, with whom Terry lived. My recollection of Terry will hardly linger on her last illness, but on her wry smile, her sharp wit, and her insightful observations at particular points in a conversation. Both sisters in their relationship of caring for one another, and in their extension of friendship to me in a time of hardship, have shown me firsthand how to carry a cross with joy. 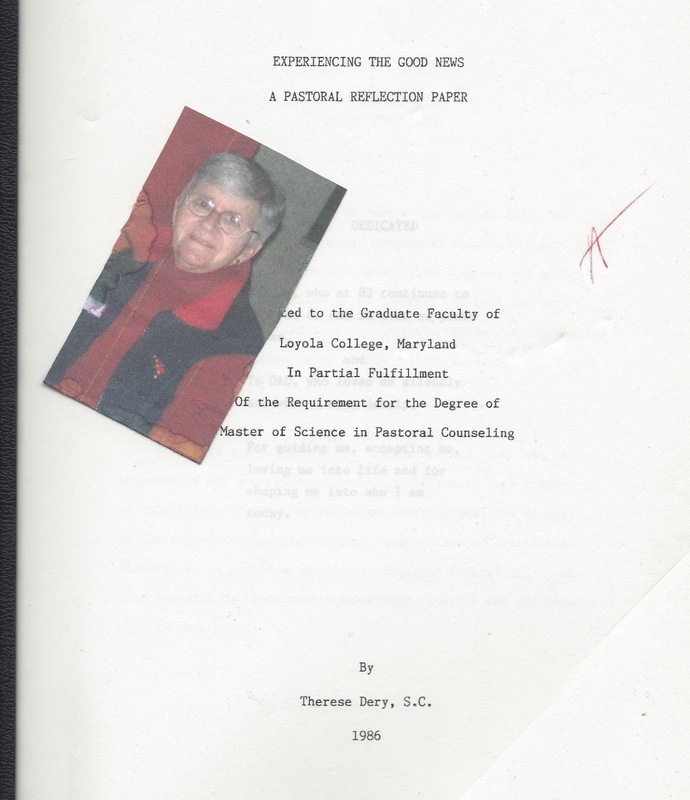 Above is a picture of Terry superimposed over the thesis she presented to Loyola University in 1986. This paper was one of Terry’s “products.” She spoke of it occasionally as a moment of personal triumph. As is evident in the picture, God took the ideas Terry had refined in the fire of her heart and moved them powerfully into the hearts of her examiners. Then he moved those ideas through Terry’s life out into the world where they assisted others. May she rest in peace forever.